Most hikers (and, well, most of the other regular humans we know) suffer from some sort of knee problems: either after 10 km of hiking, after 30 miles or just when going downhill with a heavy pack. I am no different – I used to always get knee pain when hiking and I couldn’t even run, really, at all. The reason I’m bringing this up is because I have been asked quite often, mainly by people who have known me for a while now, how I get around knee pain when pushing myself hard. I’m not a physician or a physiotherapist; I have come to know about this from the other side: I got injured when I was in the army about 15 years ago. Both knees were affected and after a long bout with physiotherapy, I had a series of surgeries. After the surgeries I basically accepted that I would never run regularly and would be very limited in terms of how much I could push myself outdoors: knee pain was always around the corner. But, like most stubborn people with a problem, I kept on trying new things, different and experimental solutions to be able to push myself without much pain. It wasn’t just for the sake of hiking or running – I wasn’t sleeping well and suffered from a lot of pain when the weather was changing. I won’t take you through the million and five ways I tried to sort out my knees but will focus on the main factors that caused knee pain for me and then I want to explain my preventative tricks to avoid pain, on and off the trail. Before we get into this, a disclaimer: I am not a doctor or any other kind of medical professional. I’m sharing my experiences and research, but take no responsibility that any of this is action you should take. Be smart about this and only do what seems right to you, at your own risk. If you have any questions, talk to a medical professional. The number one reason that most people have problems with their knees is issues with the IT band. The second (and very common) problem is weak glutes along with short hip flexors. Last, though a very controversial topic amongst hikers, is using heavy boots that create a bad gait and increase impact on the knees and back while walking. IT Band – the source of all evil? The IT Band (iliotibial band) is a connective tissue (fascia) that runs along the exterior part of the thigh between the knee and the hip; it is a non stretchy tissue that is very sensitive and very strong. I like to think of it as a very strong spring between one huge joint (hip) and the leg’s “spring” (knee) – allowing for stable movement when used correctly. The big problem with the IT band is that it can very easily get into the situation where it is being “pulled” over the knee and start rubbing over the knee joint. The IT band itself can’t be stretched and it can’t get tight, it is just a leather-like band (a very sensitive one), nothing more. The only way for the IT band to find itself rubbing on the knee is when the connected muscles are tight or weak: quads, calves, glutes, hips or any other leg issues. There are a variety of other reasons that might cause IT band syndrome (when the band is inflamed), but weakness or tightness are the main ones and easiest to solve. To read more about IT band issues, read this excellent article from Outside magazine. These are two sides of the same problem (or cause and effect) that almost always go hand in hand; they are also a major contributor to the IT band syndrome. The hip flexors are a set of muscles that operate the hip, allowing for big, long and healthy movement and the glutes are, well, the big muscles that make the other side of your hip: your bum muscles. When we sit a lot (and I’m sure you do, just like me), the hip flexors shorten. This is very common and most desk-bound people suffer from some level of it. You can read this in depth article with a test by Marin Koban for more information. The main problem with tight hip flexors is that they don’t allow us to use the glutes enough, and so we put more pressure on the quads when walking or running. It is not about having big bum muscles, but it is about having a strong internal muscle that can help the legs move better, reducing tiredness of the quads and keeping the IT band balanced. Weak glutes will lead to increased pain in the quads and IT band, “pulling” on the knee and leading to a bad gait. I wrote a long and full post about transitioning from hiking boots to trail shoes, and the main reason I mention it here is the fact that from my experience, every time I use hiking boots my knees hurt, even now. I’m not quite sure what the reason might be: gait, over use of muscles, tilt in the knee, just tired frame, increased impact on each step – all are a possibility (and I’m sure there are studies about them all), but in reality it is just experience: I’ve done the same trips in boots and in trail shoes and found that the trips with boots had knee pain at some point. 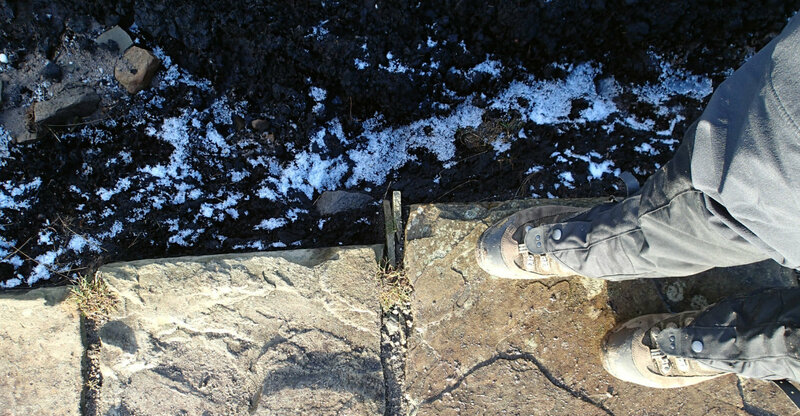 It is not just the fact that they are boots – I think a big part of it is sole stiffness: the stiff soles force you to turn your feet more when encountering obstacles, causing your body to adjust up along the leg and spine instead of just letting the foot absorb the stone or the branch. I think softer and lighter shoes have reduced my knee problems dramatically. To make the point even clearer: the last time I bailed out on a trip due to knee issues was when hiking the Offa’s Dyke with my wife back in 2011; that was also the last trip that I walked the whole way in boots. Since then I have been transitioning to trail running shoes and knee pain has been a minor nuisance rather than a reason to stop. Before going into prevention I want to quickly touch on treating knee pain: when your knees hurt you need to stop, especially with IT band problems. This is one of those things that I have a hard time accepting at times, but the only way to get better is letting your legs and knees heal. To increase the healing process use RICE (rest, ice, compress, elevate) regularly and avoid activity – the slightest abuse will cause the problem to flare up straight away. For an immediate solution on the trail, keep a pack of ibuprofen handy and only take it if the knee becomes inflamed; if you use it regularly on the trail, it won’t do any good when you are really in pain. There has a been huge boom around the foam roller: some swear by it and some find it to be a device of torture. Some claim that you shouldn’t foam roll but from my experience, foam rolling is a godsend. I had a surgery called “lateral release,” which was performed years ago to release the IT band, resulting in lots of scar tissue that caused me way too much pain. Sadly, that surgery was very common 10-20 years ago to treat knee problems so there are a number of people walking around with scar tissue on their IT bands; foam rolling is for them. If you suffer from what feels like someone trying to dig into the side of your thigh with a spoon, there is a good chance you have scar tissue: foam roll! It will be painful and will take months, if not years, until it gets better, but then it does. And it isn’t just for people who have had surgery – my wife has had various IT band issues over the years and foam rolling always got her back to action and better than ever. If you have no hot pain in your IT band – just around the knee – the problem is probably tight muscles instead of an IT band issue (for now): foam roll all the muscles around the knee and it will help prevent it from turning into something more serious. No matter what kind of training you do (or not), fit in a bi weekly stretching session, especially for your hip flexors. I’ve been making it a real project to get my hip flexors into perfect shape using a very simple (but hard) stretch: the couch stretch. It takes a while to get used to but you can do it easily when you are sitting and watching television, aim for at least 3-4 sessions a day on each hip, 1 minute (or longer) in each session. For more hip flexor stretching ideas scroll down on this article to get a few videos with ideas – they are so easy! As I mentioned, once you have sorted your tight hip flexors, you want to work on those glutes to help your quads from getting overly tired while hiking. The most widely known training for glutes is the simple squat, which I used to do, but after reading this very long and way too detailed article about glute strength I have moved to using mainly a form of reverse leg press (also known as pendulum quadruped hip extension) but with out the weight – either on all fours and kicking a curved leg up or while standing at a wall. There are all kind of ways to train glutes, just make sure to take care of the hip flexors first and work on the glutes daily (3-4 sessions, 1 minute each time). I know it sounds silly, but this is true and helpful to avoid knee problems: dehydrated muscles get cramped more easily and will get you walking funny. The bad gait and tiredness will result in an increased pressure on the knees and probably will lead to in knee pain. This again! After setting camp and before you are fully cooled down after the walk, do a series of stretches to help the legs and avoid cramps. Use any running routine stretching with some shoulder and back stretching. Even if you are a true fan of boots, upgrade to lighter and less stiff ones – hiking with a B3 boot when conditions don’t warrant it will really get you tired and are sure to increase your chances of knee fatigue and pain. Not to mention the endless impact on your spine and knees. There are millions of articles about the benefit of hiking poles – get a pair, learn to use them and make sure you always take them with you. They are not just for stream crossings; they can really reduce the amount of impact your knees get from going downhill or just carrying extra weight on your back. I’ll even add a shameless plug to my own poles if you are after a new pair. Despite how common knee pain is when hiking, you don’t have to fall prey to it. There is a lot of work you can do to make sure you are pain free when pushing it, or even in your day to day life, but it is so worth it. Losing that feeling of dread when you have a trip with long days or seeing the tight contour lines in the map is liberating. Who knows, you might start doing 25 mile days, easily and enjoyably. No matter what the issue is, you can probably solve it – experiment carefully and test things, but persist – getting your knees to a safe place takes time and patience. Good luck. Disclaimer: I’m not a doctor! Really, I’m not. I’m not a physician, orthopaedist, physiotherapist or any other kind of medical professional. If you choose to try anything based on my experiences shared here, it is all on you. If you are not sure about anything, talk to a medical professional before trying anything (but take it with a grain of salt). Either way, I’m not taking responsibility for you going “all in” fixing your knees by yourself. and get access to a few of the exclusive guides I wrote.